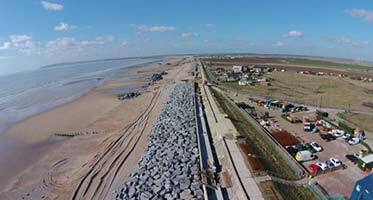 The Broomhill Sands Coastal Defence Scheme has added another award to its growing collection of industry accolades. 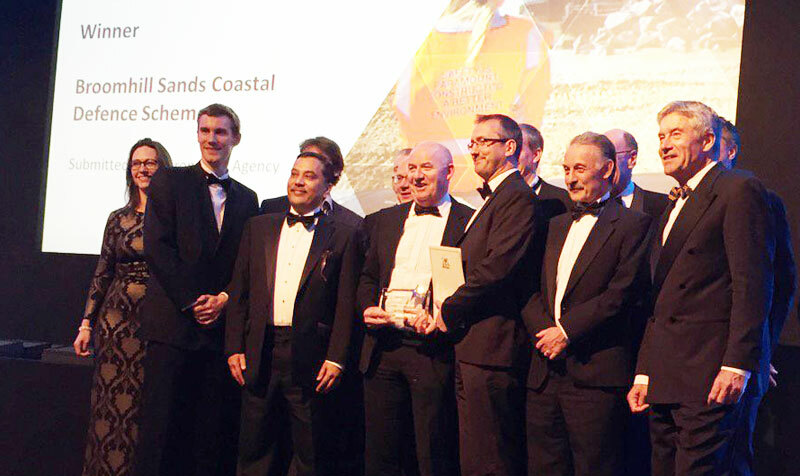 The latest recognition for the £30m Broomhill Sands scheme – delivered by Team Van Oord and on behalf of the Environment Agency – came at the 2016 South East England Engineering Excellence Awards. The ICE Engineering Excellence Awards recognise excellence and imaginative concepts in civil engineering practice across South East England. The awards recognise construction projects and promotes excellence in the engineering profession. The awards showcase the most innovative, creative and sustainable contributions to the physical and social environment. All award winners demonstrate excellence in design and construction, drawing attention to project management, financial control and health and safety. Broomhill Sands beat off stiff competition from the five other finalists to win the Best Infrastructure Project category. The Broomhill Sands scheme directly protects 1,388 homes and more than 100 businesses by increasing the standard of protection from 1 in 20 years to 1 in 200 years, allowing for predicted sea level rise. The improvements include 1.8km of rock revetment and new concrete wave wall, 700m beach recharge and replacement of timber groynes, as well as improvements to the existing promenade, including access ramps and steps. The Broomhill Sands team led on a number of innovations, many of which are ‘firsts’ for the Environment Agency, the UK and the construction industry. The Broomhill Sands scheme is no stranger to success. Last month it won the ‘Project of the Year – Civils’ category at the 2016 Constructing Excellence in London and South East Awards. Earlier this year it received the Innovation Award at the 2016 Environment Agency Project Excellence Awards which recognise excellent project work undertaken by the Environment Agency and its partners. The scheme has also been shortlisted in two categories of the 2016 British Construction Industry (BCI) Awards which will be presented in London on 12 October.